Probably the major break Erickson established with hypnostists before him was in establishing the fundamental linkages between hypnotic phenomena and everyday life. In its infancy hypnosis was mired in ideas of occult states and mysticism. In fact the history is compelling reading, for example Mesmer's collision with the scientific establishment of the day, who basically thought he was a pervert corrupting the good morals of women. Back then to be hypnotised meant to have your will and control taken from you, Svengali-like. Erickson realised that hypnotic 'states' (and there's a debate about whether hypnosis represents a state at all) are refined or amplified forms of experiences we already all have, every day. So for example a day dream is a hypnotic experience. As are things like humming a tune you'd heard on the radio a few minutes ago, or post-traumatic stress. 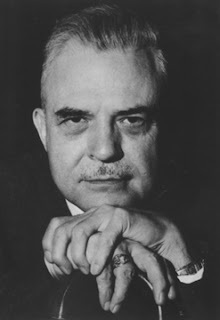 By understanding that what we see in hypnosis is merely a restricted and sometimes amplified version of everyday experience, Erickson was able to devise what is sometimes called 'indirect hypnosis', or 'conversational hypnosis', meaning hypnosis without the aid of the usual induction techniques like swinging watches and people closing their eyes and being asked to relax etc. And in fact the whole idea of induction i.e. 'putting somebody into a trance', is on shaky ground as a result of the Ericksonian method and discoveries. To this much wider experiential understanding of hypnosis you can add Erickson's superb sense of humour. Below is an extract from an interview with Erickosn, to give you a sense of both the humour and humanity of the man. ERICKSON: Well, if the kid came in to see me, the first thing I would do would be to want to examine the cross. And I would want to improve it in a very minor way. As soon as I got the slightest minor change in it, the way would be open for a larger change. And pretty soon I could deal with the advantages of a different cross - he ought to have at least two. He ought to have at least three so be could make a choice each day of which one. It's pretty hard to express a psychotic pattern of behavior over an ever increasing number of crosses. Neuro-Linguistic Programming (NLP) is a modern derivative of hypnosis, which owes a lot to the detailed work Bandler and Grinder did with Erickson. Their works are a brilliant, entertaining read, such as their Frogs Into Princes, and Trance-Formations. (They don't speak to each other any more I believe, which is always the way of things.) Much of modern stage hypnotism or TV hypnotism derives from training in NLP. Due to Bandler and Grinder's work in what they call modelling, which is their way of capturing the genius of geniuses and making it teachable, NLP is a very clear and powerful tool to learn how to do a lot of what Erickson did, and in some ways more. But in other ways less. Having said all of that, I still think hypnosis is misconceived. It works - all the stupid sceptics associations (is there any greater fundamentalist in the world than the average card-carrying sceptic and their Jack and Jill Went Up the Hill Panglossian view of what science is and does?) and their attempts to debunk it miss the point that they're attacking a straw man, i.e. the old Svengali model - and is very powerful. But it isn't a state, and can all be explained even more easily than Erickson was able to. That'll have to wait for next time. Yes, the few videos I've seen of Bandler left an impression of him being fairly vulgar and a narcissist. Grinder on the other hand still to this day seems a fairly sensible academic type. However their writings are genuinely, prodigiously creative in their own way, I would say. They didn't necessarily invent much, but were brilliant at presenting the work of others in accessible ways (which is what their 'modelling' was supposed to be about). Reading transcripts of their workshops you can't not be entertained and enlightened. There's an element of the formulaic there, but also genuine recognition that things will work out for themselves if you can get out of the way. And (and here I disagreed with LM folk) also a recognition that one doesn't need to consciously understand things to have profound change. I do think hypnosis works with attention, although as LM also notes attention is not really a faculty in itself. I'm not really sure trance is a 'state' that exists, and it's also (I would say) a very common experience, rather than one we're not used to. But I'll get to that in the next post. In fact if we look at the flipside of that, it's possible to re-cast all of our problems as experiential ruts, rather than cognitive misunderstandings. Our ideas and beliefs emerge together with these ruts, and it's not really a chicken and egg question, because just practically the world and reality is a much bigger thing than the thoughts any of us have about them. So it's quite strange to want to say the ruts come from the ideas, rather than the other way around. This is why so often a 'change will do you good'. That to me also seems a much more consistent whole-pattern approach to problems than to talk about patterns and then shrink them back into conscious understandings of them. Nobody would ever grow and mature if they needed to reason things out, experience - the whole pattern - does it for them. When they get into a rut yes they can sit back and tease it apart in that conscious sort of way, but I would argue then that this is just a choice of ways to proceed, and not the obviius first choice (I'd have thought) if wholeness and patterns is your guiding principle. As Fletcher showed, people even with chronic problems can just 'do something different' to what they would normally do, and the rut breaks up by itself without any need to reason it out at all.